Its official, wedding season is here! That means lots of balloons, flowers, food, friends, and family but most of all, lots and lots of pictures. You’ve probably spent countless hours planning every last detail from dresses to napkins and everything in between. After all, you want your special day to be picture perfect. You’ve spent so much time making everything exactly how you dreamed it would be, but what lasts for decades afterward are your wedding pictures. It has been well documented that the first thing people see when looking at a picture is the smile. This day is about you, make sure you have a dazzling, photo-ready smile. Dynamic Smile Design in Orlando is one of the best cosmetic dentistry destinations in Orlando and even the greater Florida area. Wedding photos often last for generations and are shared and passed down as brides and grooms become moms and dads, and moms and dads become grandmas and grandpas, whose legacy becomes essential to new generations. A smile makeover combines restorative, cosmetic, and general dentistry services to address all functional and aesthetic problems impacting the teeth and gums. Having these procedures performed concurrently allows for much faster results, making this particular treatment uniquely suited for wedding day perfection. Tooth Whitening: Sometimes we still feel self-conscious about our smile even though all our teeth are straight and well aligned. The other half of what makes a great smile is that our pearly whites and in fact white! We offer Zoom! Whitening in our office or an at-home system to help you whiten your smile. Cosmetic Bonding: Accidents happen, we understand. A chipped or cracked tooth can be fixed quickly with one-visit cosmetic bonding and can provide a temporary solution until a more permanent one can be scheduled. Cosmetic bonding will repair the tooth with a similarly colored material that can be shaped and polished, so your tooth looks normal again. Porcelain Veneers: Teeth that are fundamentally healthy but look misaligned, crowded, gapped, or stained beyond the help of whitening treatments can benefit from porcelain veneers. In some cases, porcelain veneers alone will serve as a wedding day smile makeover. Veneers are incredibly thin and can be placed over natural teeth with very little preparation, and their versatility enables them to address myriad cosmetic flaws. Dr. Puig specializes in creating a natural, perfectly spaced smile for you and the veneers can be bonded to your teeth which will leave you with a smile that can last a decade or more. Invisalign: Traditionally braces have been used to align teeth. However, they leave your mouth full of metal and are conspicuous and sometimes uncomfortable. Dr. Puig offers Invisalign clear braces to her patients, providing a way to quickly, effectively, and painlessly create the smile of your dreams. 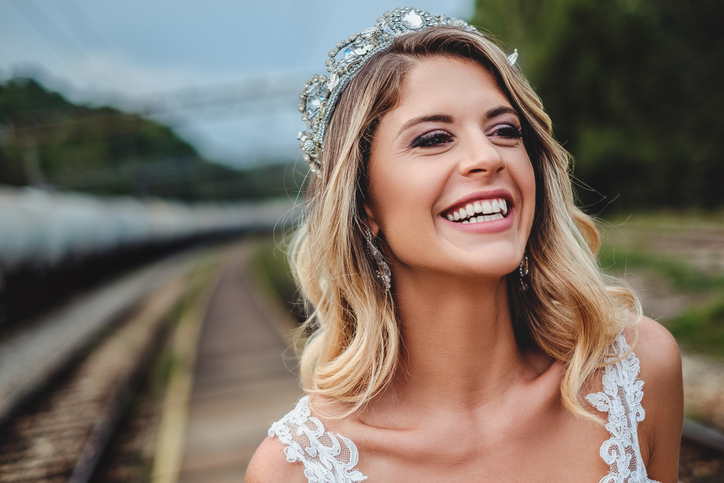 If you’re interested in upgrading your smile for an upcoming event, contact us today to make sure we can get you in well ahead of your special day and give you the smile you’ve always wanted!